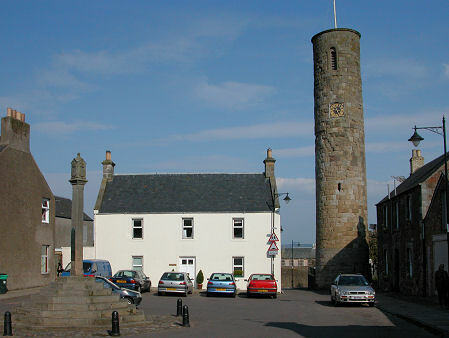 Abernethy Round Tower stands close to the centre of the ancient village of Abernethy in the south west corner of the churchyard. 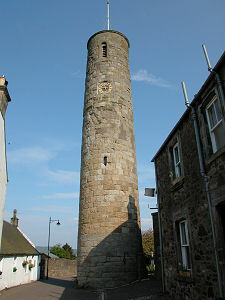 It is a rare example of a circular freestanding towers surviving in Scotland: the only other is in Brechin. It is in the care of Historic Environment Scotland. The tower is 74ft/22.5m high and 15ft/4.57m in diameter at the bottom, tapering to 13ft/3.96m at the top. The walls are made from sandstone blocks laid in courses, and are 3½ft/1.07m thick. The bottom dozen courses are of a grayer stone than the rest of the tower, leading to speculation that the base was built some time before the rest, or that the upper parts were rebuilt some time during the early life of the tower. 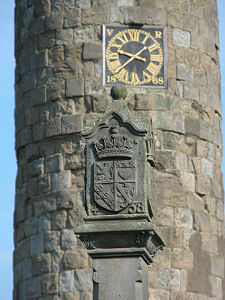 Minor changes have been made to the tower at various times including blocking of windows and the addition of a clock: the current clock carries a date of 1868. Internally, there are signs that the tower originally had six wooden floors, which were presumably accessed one from another by ladders. 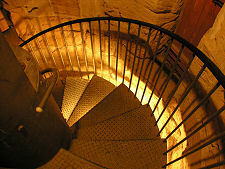 Modern access dates back to 1982, when a metal spiral staircase was inserted into the body of the tower. Freestanding circular towers like the one found in Abernethy started to appear in Ireland in the 900s, and over the following centuries they became a relatively common feature of the Irish landscape. They were much more of a rarity in Scotland and it is thought that the tower in Abernethy was built by Celtic Culdee monks who had established a monastery here some time around 1100: though different sources can disagree by up to a century either way, and there is the added uncertainty brought about by the possibility that the tower was built in two stages. The purpose of round towers is another subject that has given rise to considerable debate. The most common view, brought about by references in the Irish Annals to bell-towers, was that they were intended to ensure that hand bells rung by the Culdee monks could be heard over the widest possible area. This is a considerable step forward in our understanding: as recently as the 1800s the round tower at Abernethy still attracted speculation about its purpose that ranged from a pre-Christian religious monument to a Pictish royal burial chamber. 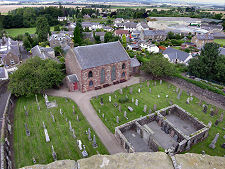 The entrance to the tower lies within Abernethy Churchyard. 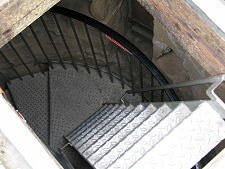 The tower door is accessed up a short flight of wooden steps and is normally locked. The key can be borrowed either from the Culdees Tearoom, a few yards away from the tower across School Wynd, or from the Museum of Abernethy, which can be found a short distance north along School Wynd. Once inside, you climb the metal spiral staircase that winds round and around, eventually arriving at a platform just beneath the roof of the tower. From here it is a short climb up a metal ladder and a scramble through a trap-door out onto the roof. The views from the top are superb, stretching north across the River Tay, and east and west along the northern edge of the Ochil Hills. They are also especially good, of course, of Abernethy itself. Just keep an eye on the time to avoid being too surprised by the chimes of the clock, being struck, it seems, just under your feet. Abernethy Round Tower may have postdated the age of the Picts by several centuries, but it does carry evidence of Abernethy's important role in the Pictish world. 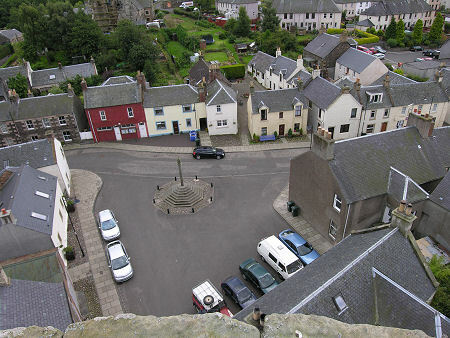 Set upright against the base of the tower, just outside the churchyard gates, is "Abernethy 1", a Pictish symbol stone found in the village and placed here under a coping stone intended to protect it from rain flowing down the side of the tower. It probably dates back to some time around 600. 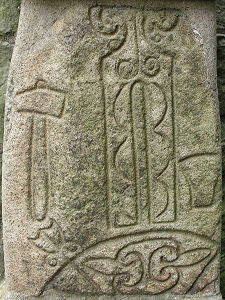 The stone was found forming part of the foundations of a house, and seems to have been trimmed at some point, resulting in the loss of parts of some of the symbols. 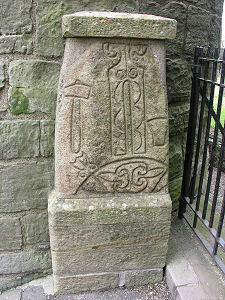 The main symbol is of a vertical tuning fork, a relatively common Pictish symbol found carved on stones. Underneath it is another common symbol, a "crescent and V-rod", or at least part of one. Much more unusual are the carvings of a hammer, on one side of the tuning fork, and an anvil on the other. These have only been found on one other Pictish symbol stone and bring to mind the symbols relating to trades found on gravestones many centuries later in the 1700s. A final adornment of the tower worth mentioning is a set of "jougs" a padlocked iron band attached by a chain to the tower about five feet above the ground. 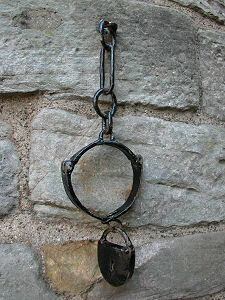 A variant on village stocks, this would be attached around the necks of wrongdoers, who would then be left on public display for a period that depended on the nature of their offence, as a lesson to others. 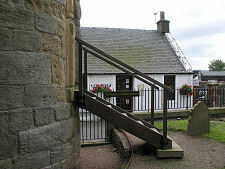 Jougs are fairly common across Scotland, but more usually attached to tolbooths or other civic buildings.